A summer with his grandfather was all it took for him to be inspired. When Mukund Venkatakrishnan was 14, he visited India and was tasked with helping his grandfather get tested and fitted for a hearing aid. He saw what a costly and difficult process it was and resolved to find an alternative. "Since audiologists are specialists, even finding and getting an appointment with one in India was really hard," said Venkatakrishnan, who is now 16. "And then we got ripped off." Venkatakrishnan said they spent about $400 or $500 on doctor's appointments and about $1,900 on the hearing aid itself. He realized that hearing is a luxury many people in developing countries can't afford. "In India, the median household income is $616 a year," Venkatakrishnan said. "If someone in India saves all year without spending a penny, they still can't afford a hearing aid." 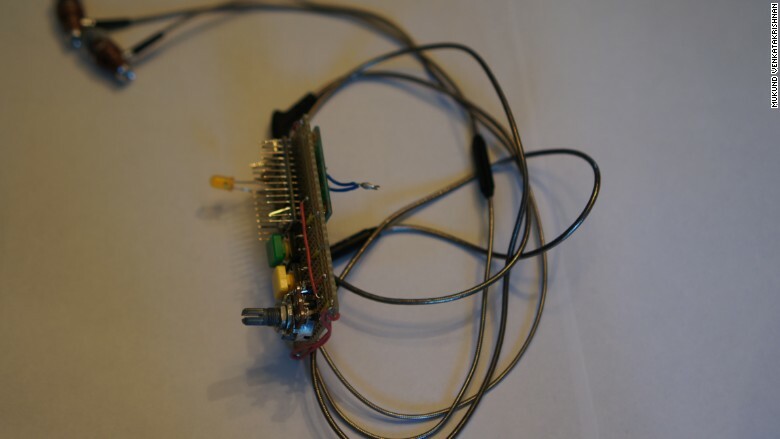 Venkatakrishnan's device is unique because it not only tests a person's hearing with a series of beeps, but it also programs itself to become a hearing aid. 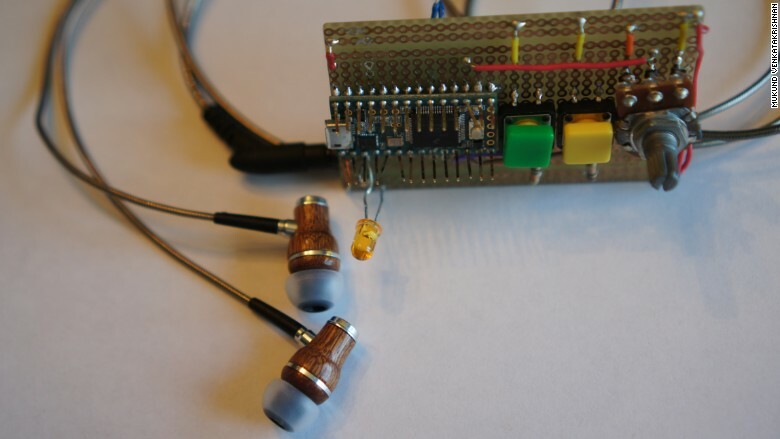 It only costs about $50 to make and can be used with even the cheapest set of headphones. Unlike with traditional hearing aids, if the ear piece gets damaged it isn't costly to replace -- you just buy another set of ear buds. In its current form, the device is about two inches and looks like a computer processor. Venkatakrishnan is planning to bring it down to about one inch and encase the operating system. He envisions the device, which has a standard headphone port, fitting into someone's pocket. What makes the device ideal for developing countries is that it works with any pair of headphones. Venkatakrishnan even created a way for users to calibrate the device themselves. Each device has an audio file of the sound of hands rubbing together. To calibrate it, a person just has to rub their own hands together and match the volume of the audio file with the volume of their own hands. If the user can't hear their own hands, someone else can calibrate it for them. Venkatakrishnan, now 16, spent two years teaching himself to code, building the audio program and developing the device. He made it completely on his own but received guidance from engineers, like his father, and audiologists. Working with the doctors, he conducted tests on patients with hearing loss to make sure his device was accurate. The device works by first administering a hearing test -- press green if you hear the beep, yellow if you don't. Venkatakrishnan said there's also a fair amount of stigma associated with wearing a hearing aid. "Getting my grandpa to first admit he needed a hearing aid was difficult," he said. "I'm hoping that since my device uses headphones and isn't in-ear, it will reduce some of the stigma." Venkatakrishnan said his 81-year-old grandfather is already really excited about the device. He plans to show it to him when he visits India this summer. While Venkatakrishnan is eager to make a difference, he isn't trying to make money off his invention. He's adamant that the audio software remain open source so other developers can modify and tweak it. And he's hoping an organization that already has connections in developing countries will want to mass produce and distribute the device. "I've just started talking to someone from the Bill & Melinda Gates Foundation," Venkatakrishnan said. Medicare doesn't cover hearing aids and hearing aids cannot be sold over the counter in the U.S. When he isn't teaching himself to code and trying to combat hearing loss, Venkatakrishnan said he likes listening to music and running long distances. He's already run "quite a few half marathons" and has been playing violin for 12 years. Venkatakrishnan, who was born in India and moved to Louisville, Kentucky, when he was three, said he's beginning to consider colleges. He's a junior and is looking at Stanford, Georgia Tech, Berkeley and MIT -- his "stand out choice." He thinks he may want to do something with coding or engineering but he's also interested in business. For now, he still has tweaks to make to his device, which he hopes to use to help others "amplify life."